we went to mt. rushmore on monday && i was pretty excited to be there. i've wanted to see it ever since i saw richie rich back in the day, & it did not disappoint. i've heard a lot of people are let down once they see it in person, but i for one could not have been more pumped on it. austin & i are both into doing overly toursity things like seeing all the national monuments & taking a ton of pictures... so it works out. & luckily my mom also is, otherwise this trip to mt. 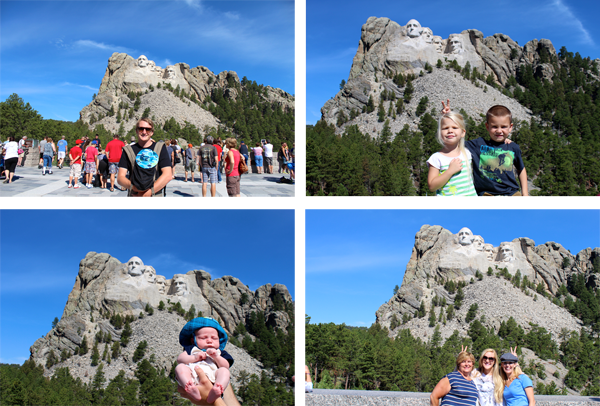 rushmore would not have happened. we got there early in the morning & it was already crowded, which is the issue with this tourist thing. we got there, took some pictures & walked along the path they've got going on to give different views of the carving. there is also some info on how they did it & all that jazz. after staring at the monument some more, we made our way to the airport to go to chicago for the week. FUN! Always wanted to go!